Even the most deep rooted traditions can have an inauspicious beginning. So it is with the St. Louis BBWAA Dinner. 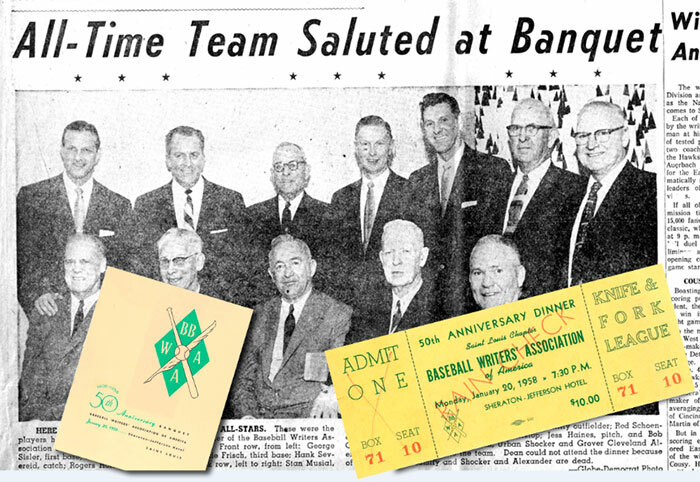 As the sitting president of the Baseball Writers’ Association of America, Bob Broeg attended many of the other BBWAA dinners hosted in the winter of 1958. While attending the Cleveland dinner, it dawned on him that his own St. Louis chapter had not yet planned an event to commemorate the upcoming BBWAA 50th anniversary. While nobody knew better than Broeg that producing a special even on short notice wasn’t going to be easy, he also knew that calling a St. Louis BBWAA chapter meeting to order might have been the more monumental achievement. 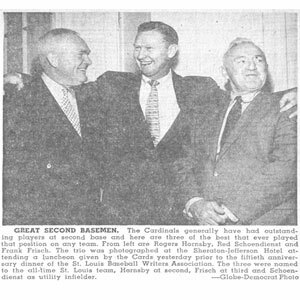 The St. Louis BBWAA had a very robust membership through the first fifty years but they had not held a chapter meeting since 1927 after a passionate debate turned physical (the subject of the discussion is lost to history). Broeg knew the odds of uniting the St. Louis membership – even around such a noble anniversary – were not in his favor. Besides, would St. Louis baseball fans ‘give a hoot’ about a dinner? What would the ‘hook’ be to attract fans to the event? 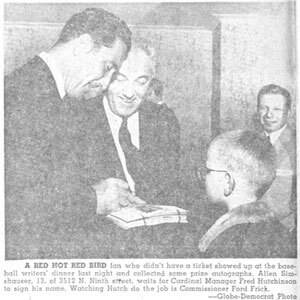 After polling the other senior members – long-time Post-Dispatch sports editor/baseball writer and future Hall of Famer J. Roy Stockton was ambivalent and Bob Burnes was busy hosting his “Open Line” radio show on KMOX as well as penning his daily column for the Globe-Democrat – Broeg knew it was going to be up to him and his wife Dorothy to bring the event to life. 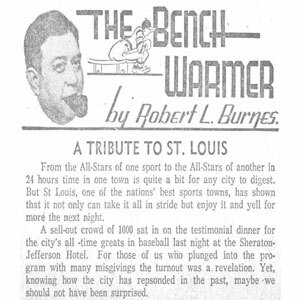 Even though this was promoted as the Baseball Writers’ Dinner, the lineup was pretty heavy with an NBA influence. Broeg needed a baseball hook. In response, Stockton, Broeg, Burnes and East St. Louis Journal sports editor Ellis Veetch developed and selected the All Half-Century Team to celebrate the baseball tradition in The Mound City. The guest list would feature greats from the NL Cardinals and recently-relocated AL Browns to give every baseball fan something to cheer about one more time. The first Dinner was held at the Gold Room of the Sheraton Jefferson Hotel on January 20th. More than 1,000 people answered Broeg’s invitation answering his question that, yes, baseball fans do ‘give a hoot’ about a winter dinner celebrating St. Louis’ favorite summer pastime. The great Buddy Blattner emceed the hoops agenda. Joe Garagiola was invited to host the baseball portion but he was snowed out and was unable to attend. Burnes and Stockton pinch hit for The Hill native. The event cleared $1,000 and a new tradition was born. 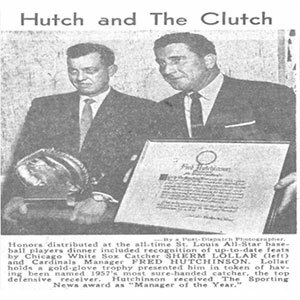 The St. Louis BBWAA Dinner has been held every year since 1958 (minus one). The chapter event is only one of three that survive (Boston and New York) and serves as the unofficial close of the previous season and the first pitch of the upcoming season…all in one glorious night. The NBA All-Star Game was also a point of pride for the home town. St. Louis Hawk Bob Petit was the game MVP after scoring 28 points and grabbing 26 rebounds. The BBWAA Dinner Committee meets monthly again. And while there most certainly is robust debate, a punch hasn’t been thrown since 1927.